Decorators, you may contact us with your DBA or TAX ID number, on your company letterhead for a special "DECORATORS DISCOUNT"
It's a bed and a night lite all in one! Decorators across the southwestern United States have used our beds in their designs! 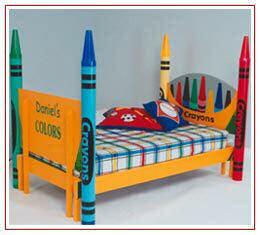 Each hand-crafted Crayon bed features night lite bed posts on the headboard that fill your child's room with soft colored light. Personalized name plates and color palettes offer that special touch. Our patented design allows for solid construction of a bed that will hold up to rough and tumble play, and be passed down for generations.